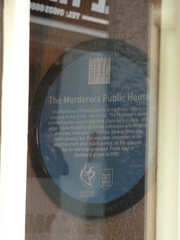 The Murderers Public House The Murderers/Gardeners Arms Public House is unusual in that it has two names. The Murderers name commemorates events that took place here in June 1895, when Frank Miles murdered his estranged wife Mildred, who lived here with her mother. He was given the death penalty, but this was later commuted to life imprisonment after public outcry, on the grounds that he had been provoked. Frank died in Parkhurst prison in 1905.